Our self catering holiday cottage accommodation offers a choice of two properties,Inch Hame sleeping 4/5 persons (which is on the right-hand side in the picture above) and The Sheiling, the smaller property which sleeps just two persons (situated at the rear of the above building). 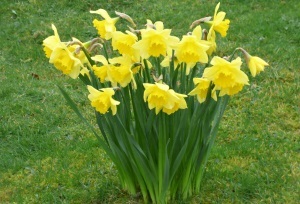 Use the buttons above to see more details about the self catering holiday cottages. Ardrioch is a small farm croft set in its own 35 acres of paddocks and woodland with scenic loch views to the rolling hills beyond. The farm lies between the lovely village of Dervaig and Calgary Bay with its white sandy beach. The property has a large flat lawn at the rear suitable for children to play on and a more wild rugged landscape at the front filled with birds and birdsong. There is a large shed for use to put bikes and kayaks. Wet clothing and boots can be dried in the boiler house. 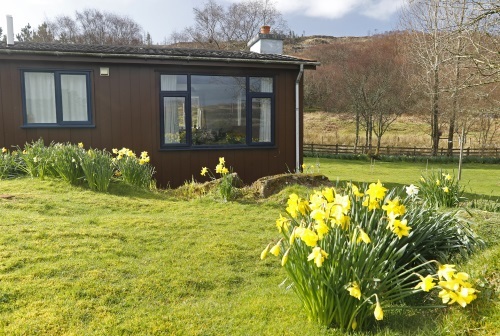 Ardrioch Farm is a cedar wood property on one level, set in an informal garden with lovely views across Loch Cuin, a sea loch, to the hills of Quinnish beyond. The farm is a small croft where sheep graze in the fields around the house and there are 20 acre of deciduous woodland for our guests to enjoy, in which we have had the very rare Large Heath Butterfly. We have a nesting pair of White-tail Eagles at the back of the farm, the nest can be seen just a few minutes walk from the self-catering and this photo was taken by Robert Farrow, a guest staying in our self-catering cottage. 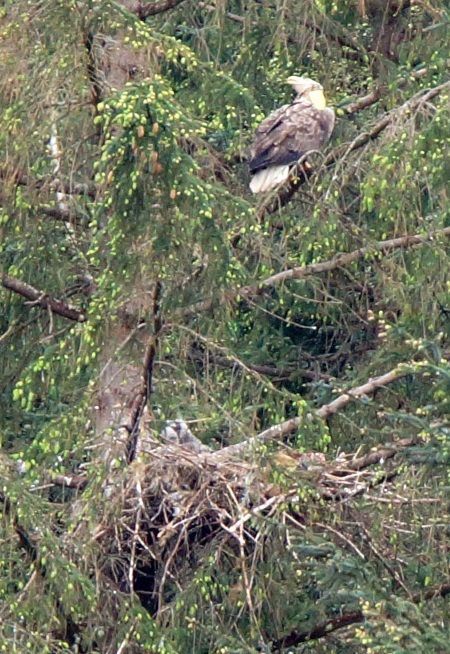 The adult eagle is sitting just above the nest with 2 chicks in, later we watched the adult feeding the chicks. The eagles are seen regularly flying over the house and garden. For more pictures of the eagle go to the Garden Birds page. White-tailed Sea Eagles and Hen Harriers can be seen flying over the hills and woodland at the rear of the farm and we have regular visits to the garden from a Buzzard and Sparrowhawk. A short walk to the lochside may produce possible Red Deer and Otter as well as breeding ducks and waders. A tour with Discover Mull wildlife is very worthwhile. Based at the farm, it will give you real flavour of everything Mull has to offer in the way of wildlife and spectacular scenery. 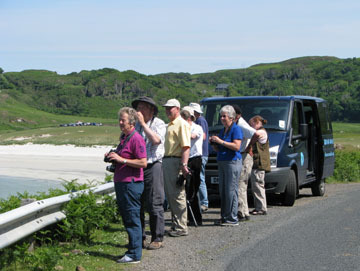 A tour early in the week is recommended to give visitors the knowledge of North Mull's best wildlife watching sites. To see the latest sighting check out Arthur's Blog. 2O19 WILL BE THE LAST YEAR THAT DISCOVER MULL WILDLIFE TOURS WILL BE OPERATING AS WE ARE RETIRING WITH OUR LAST TOUR GOING OUT ON SUNDAY JULY 14TH 2019. If you wish to join us on one of our tours book early to avoid disapointment, we hope to see many previous guests in our final year as well as lots of new guests. Ardrioch is situated one mile from the picturesque village of Dervaig, where The Bellachroy Inn serves excellent food. Dervaig Premier Store and post office is the best food store on the island so you don't need to stock up in advance. 4 miles away lies the beautiful scenic Calgary Bay with its wonderful white shell sand beach, a must stop for any visitors to this magical island. At "Calgary Art in Nature" there is a restaurant for lunches and Art Gallery as well as a lovely woodland walk. ‘Am Birlinn’ restaurant is just 1 mile away using locally sourced products this also has excellent food. At Croig and Langamull there are lovely walks and beaches. Tobermory, 9 miles away, is the main town on the island and has a colourful main street and large scenic harbour. Around the main car park is a new marine centre, a whisky distillery and a garage with petrol pumps. Tobermory has an excellent book shop, an arts centre and a super chocolate shop. There are several restaurants, 3 pubs and a great fish and chip van in the town so you won't starve whatever your food preferences.